New research from Nationwide Children’s Hospital shows that around 12,500 kids are treated in US hospital emergency departments each year for injuries caused by cotton tip applicators. That’s about 34 each day. In most cases, the swabs were used for cleaning, but as this study shows, it’s simply not worth the risks. Thankfully, there are safer ways to get rid of that gunk in your ear holes. No doubt. As Jatana’s new study shows, cotton tip applicators are bad news—especially when children are involved. Using National Electronic Injury Surveillance System (NEISS) data collected from 1990 to 2010, her team documented over 263,000 cases in which kids under the age of 18 were treated in a US hospital emergency department for injuries caused by a cotton swab. In nearly three-quarters of those cases, injuries were sustained during attempts to clean the ear. In the remaining cases, the injuries were caused by playing with the applicators (10 percent) or during falls when kids had the applicators in their ear (9 percent). This research now appears in The Journal of Pediatrics. Accidents typically occurred when kids were using the cotton swabs themselves, accounting for 77 percent of all cases. Parents were responsible for another 16 percent of the ER visits, while sibling swabbing accounted for the remaining six percent. Two-thirds of patients were younger than eight years of age, and 40 percent were younger than three. In terms of the injuries sustained, children were treated for foreign body sensation (the feeling that something’s inside the ear), perforated ear drums, and soft tissue injuries. In the vast majority of cases, patients were treated and released. But an unlucky few experienced damage to their ear drum, hearing bones, or inner ear that led to dizziness, problems with balance, and irreversible hearing loss. “While the number of overall injuries from cotton tip applicators did decrease during the 21 years we looked at in our study, it is still unacceptably high,” said Jatana. “These products may seem harmless, but this study shows how important it is that they not be used to clean ears.” In fact, a set of guidelines published by the American Academy of Otolaryngology—Head and Neck Surgery Foundation earlier this year said the exact same thing. The medical value of having an ENT [ear, nose and throat specialist] clean ears that have a history of problems should not be underestimated. One the most powerful principles in medicine is the act of cleaning. Dead skin (desquamatized keratin) accumulates in ears and can attract moisture and serve as a breeding ground for bacteria and fungus. These can cause irritation and itching. Clean, healthy ear tissue does not itch. The other way is to do it yourself. The U.S. Food and Drug Administration (FDA) has approved only one substance for the removal of wax (cerumen) from ears. The technical name for this compound is carbamide peroxide, and it is found in all the over-the-counter earwax-removal products. This thick liquid is put into the ear canal with a dropper and then the ear is rinsed to remove the peroxide and any wax. Basically, all over-the-counter drops that help to remove wax are oil and peroxide solutions, which is why some doctors tell their patients to put a few drops of baby or olive oil in their ears about once a week or so. Recently, I had a serious build-up of wax in my ear to the point where it was affecting my hearing. My doctor told me to apply these drops about two to three times a day for about a week, and then return for a follow-up visit. During this second session, she used an ear wax irrigation syringe to wash out the wax, which had been loosened by the oil. The experience went very much like this, and we were both aghast at how much wax came out of my ear. 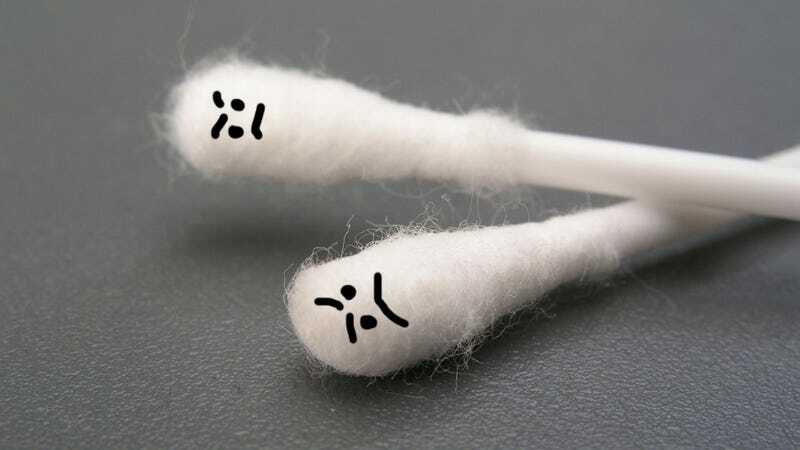 Given these simple and effective solutions, you shouldn’t even think about putting a cotton tip applicator in your ear. And if you’ve kids, it would probably be a good idea to keep these dangerous swabs out of reach.